Following his relegation from the world’s top 64 at the end of last season following defeat to Steve Davis at the World Championship qualifiers, some might have expected Jamie Cope to have struggled this year, particularly having seen his ranking points removed and ranking effectively reset to zero. His results so far have however been encouraging and today he recorded his best win in recent seasons, edging out Neil Robertson to reach the last 16 of a full-ranking event for the first time since the 2013 Australian Goldfields Open. It was a topsy turvy match with Jamie winning the first three frames, before Robertson responded with four in a row to move just one away from victory at 4-3. 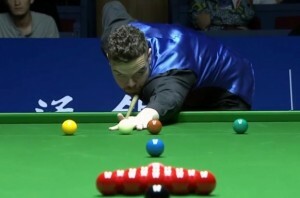 Competing in his first professional event in a number of weeks however, there were signs of rustiness from the Australian and Jamie was able to claim the last two frames for a well-earned victory. Next up for him will be a match with Mark Williams, after the Welshman recorded a comfortable win against Tom Ford earlier today to progress to the last 16. Some readers may remember their meeting at the same stage of this event back in 2008 when it was Williams who came out on top, but Cope who made the headlines with a maximum break during the third frame of the match. Looking at the other high ranking players to be missing from the last 16, two of course are the result of byes with Ricky Walden heading home following the birth of his first child, while sadly Mark Selby has also had to cut short his visit to Shanghai due to a family bereavement, reported to be that of his father-in-law. Walden had been scheduled to play Matt Selt, who now moves onto a meeting with Judd Trump, who recorded the only whitewash of the round to quickly dismiss Robert Milkins yesterday. The beneficiary of Mark Selby’s withdrawal meanwhile is David Grace, who is now into the last 16 of a full-ranking event for the first time and will face Mark Allen tomorrow, after the 2014 Shanghai runner-up withstood a tournament high break of 140 from Luca Brecel to win 5-3. Elsewhere there were impressive victories for Martin Gould and Michael Holt, who saw off Riga Open winner Barry Hawkins and Scotland’s Stephen Maguire respectively to reach the last 16. Gould, presumably in good health despite the ear condition that has threatened his participation in overseas events, will now play John Higgins in a repeat of the first ranking event final of the season, the Australian Goldfields Open. Holt meanwhile will meet Kyren Wilson in a repeat of their quarter-final here back in 2013, when both recorded the best ranking finishes of their respective careers to date. Kyren earned his place in the second round today with an impressive victory against world number nine Joe Perry. For Mark Davis came an eighth successive victory against Michael White in all competitions, by the surprisingly wide margin of 5-1 and he will play Shaun Murphy, who came back from 4-1 down to edge out 2002 world champion Peter Ebdon. Defending champion Stuart Bingham got his campaign underway with a 5-2 victory against wildcard Fang Ziongman and is rewarded with a meeting against Mike Dunn, who made it through to the last 16 of a full-ranking event for the first time since his semi-final run in Beijing last year with an impressive win against Marco Fu. Finally, 2013 champion and home hero Ding Junhui played well to progress a 5-1 winner against veteran Scot Alan McManus and will now face a man who has at times proven to be something of a nemesis to him in recent seasons, Welshman Ryan Day, who defeated Graeme Dott back on the opening day.